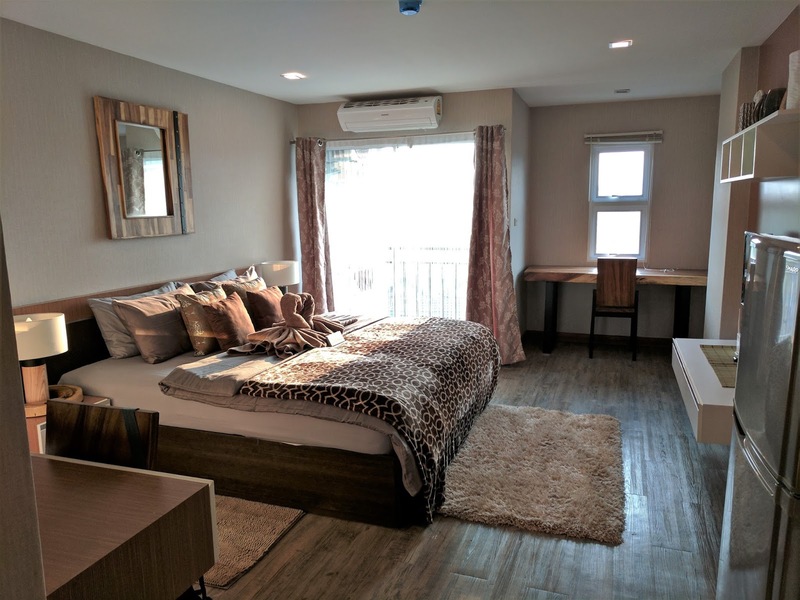 In case you're wondering where we've been lately, these last three days have found us getting settled in Chiang Mai, located in northeastern Thailand. 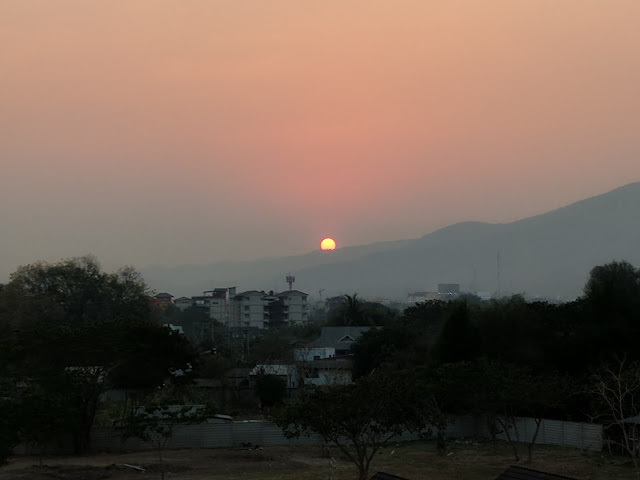 We arrived at our Chiang Mai AirBnB rental at sunset. It was 102 degrees F. It is hazy here, as the farmers are burning the fields in preparation for the coming rains but it was still a lovely sight from our balcony. It didn't come out in the photo, but the sun appeared as a perfectly round, bright red ball - simply gorgeous! After a couple of weeks of moving at a reasonably speedy pace while island-hopping, we came north to the small city, popular with western expats, in order to take care of the necessary business of life and to plan our next steps. 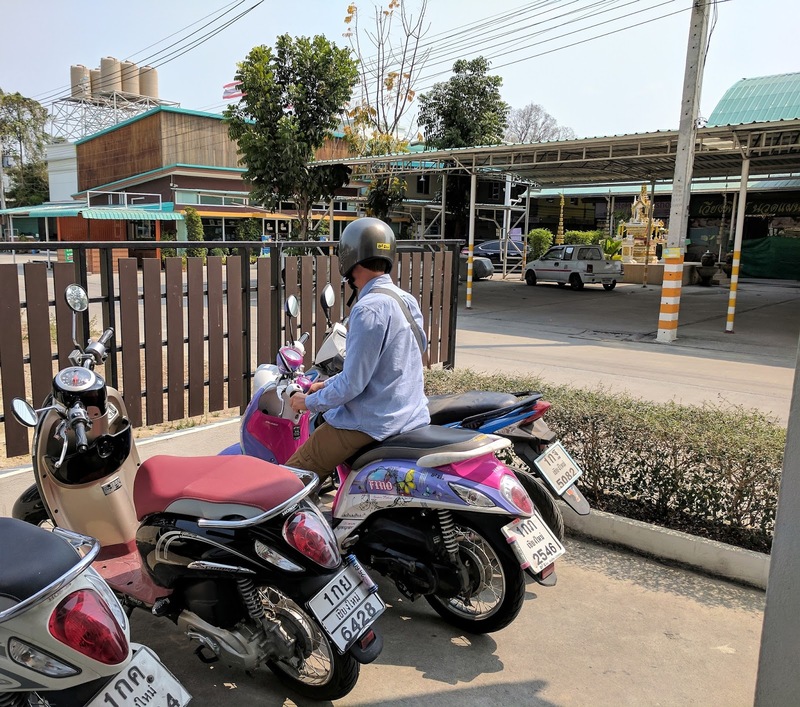 We had recently been discussing a short road trip to Chiang Rai Province and the Golden Triangle, just up the road from Chiang Mai. Then, in mid-April, we'll be leaving Thailand to embark on a 3-week jaunt to Myanmar, for which we obtained visas prior to leaving NYC. But more about these expeditions later. Our Friday afternoon flight from Krabi to Chiang Mai was smooth and uneventful. Luckily, there were no snakes, real, stuffed toy or rubber, on the plane as they are strictly prohibited. Huh??? After collecting our bags and being turned away (again) by the taxi stand worker because we didn't have an exact address, we easily ordered an Uber to take us to the small condo we rented on AirBnB. 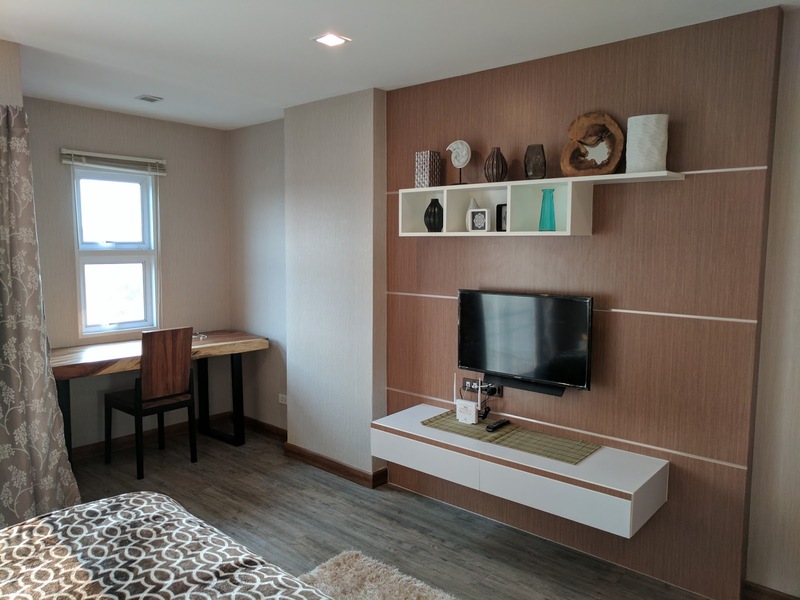 Although located in a less fashionable part of town (our dates are still technically high season and we booked last minute so our options were limited), the photos of the condo looked appealing and the "hostess," as the owners who rent their condos on AirBnB and VRBO are commonly called in these parts, got great reviews, further boosting our confidence. As we climbed into​ the car, we were met with Cake by the Ocean, the American pop hit, playing at high volume on the stereo. Our driver turned out to be a pleasant, young lady with a big smile and braces on her teeth, even if she appeared barely old enough to be driving a car. But she was a skilled driver and we arrived at our new home, a stylishly designed, 500-square foot studio apartment located in a newer building, in no time. Our cozy, yet comfortable home for the next three weeks - one of the best features is the super strong Wi-Fi! The desk for our laptop is also nice. 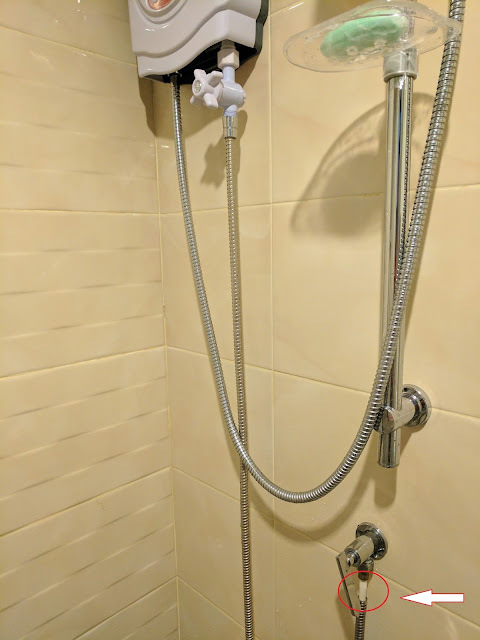 Unfortunately, we were greeted at the condo with a broken shower hose. The owner was very responsive, but as it was the weekend, it took a couple days for the repair. Who needs to be clean, anyway? That first post-repair shower was the best! Since we're here for a bit of a long-haul - the next 3 weeks - we picked up some minor household supplies and snacks to have around and started to get down to business. Our tax guy in California is great so our communications with him are typically pretty painless at this time of year. However, he needed a signed form from us for our State of New York filing (California and New Mexico are fine with e-signatures), so Scott went off in search of an internet café with a printer he could use. It was a bit of a complicated process, but ultimately, with successful results. Chiang Mai doesn't have a good public transit system and we quickly realized that we would need to rent a scooter (known as a motorbike in local parlance) in order to get around town for the next few weeks. We made the short walk to the motorbike rental place recommended by the owner of our condo. The scooter rental guy spoke great English, so the transaction was easy and smooth and within a half hour we raced off, helmets strapped on our heads, into traffic on our petite, pink and purple scooter, that had script reading "Romantic Fashion" on the side. We. Looked. So. Cool. But cheesy-looking scooter equals cheap rental price. 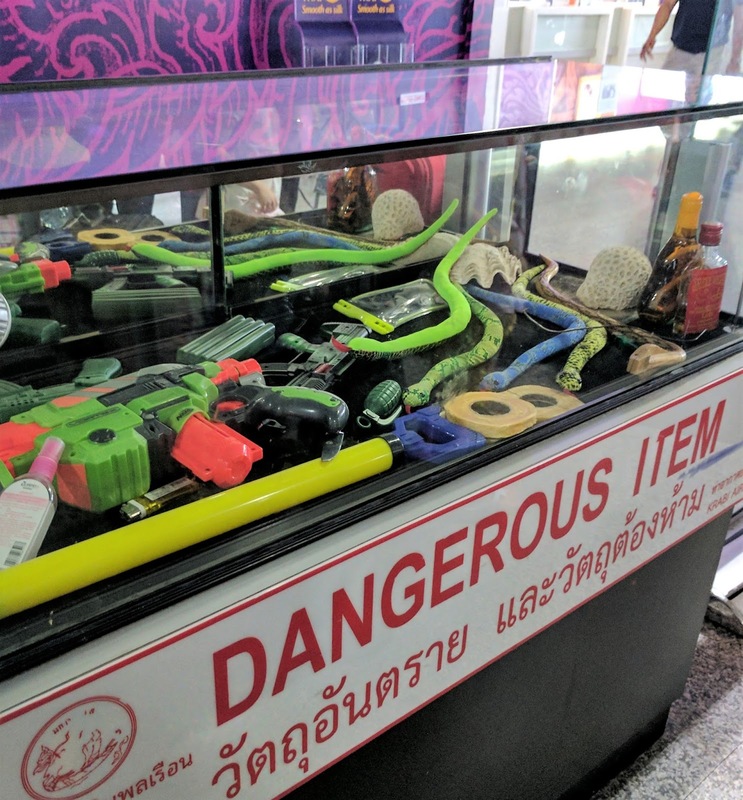 Just 150 baht (just over $4) per day! Sadly, the young, friendly, non-English speaking security guard at our condo building visibly appeared to lose respect for us (or at least for Scott, anyway - ha) as we pulled up to the building on our sweet, (not at all) new ride. Scott pulls into the condo parking area on our new Barbie Ride! Parked at the condo, with all the other normal-looking scooters. 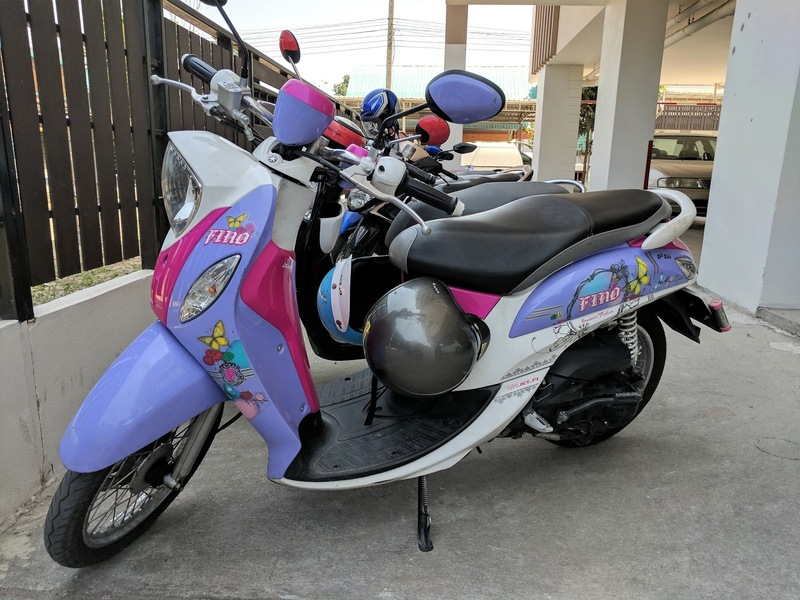 Really, who doesn't want to ride a pink and purple scooter??? We had not had any laundry done since we left Bangkok and we were pretty much out of clean clothes. 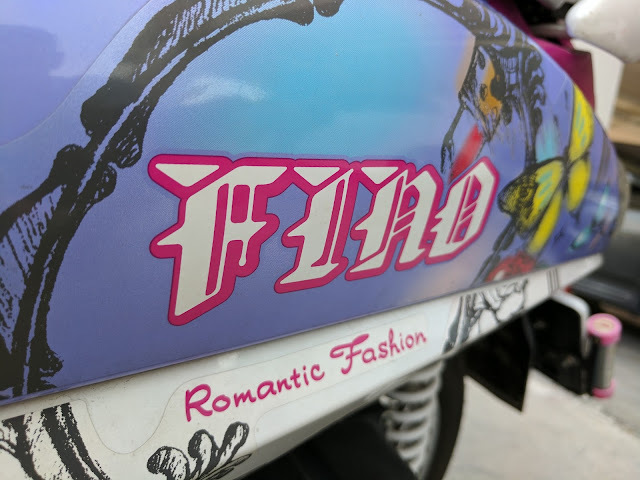 Here in Chiang Mai, there is less English spoken than in Bangkok and the islands, and there is even less written English on signs and businesses, so it was hard to distinguish anything resembling a laundry in our neighborhood. Luckily, through Scott's diligent research, we were able to locate a laundry that seemed very service-oriented, offering free pick up and delivery, as well as separating dark and light loads with bleach, all for a very reasonable price. They picked up our dirty laundry and dropped off our clean, neatly folded clothes exactly as scheduled. Getting laundry done here is unbelievably cheap! This receipt for one small bag and one large bag of cothes set us back about $4 USD. But when we unpacked the clean clothes, we discovered that a bunch of Scott's clothes were missing! He emailed Em at her laundry and she promptly provided a detailed list of what was checked in by them after pick up. She politely insisted that the clothes that Scott was missing had not been dropped off. Fortunately, Scott is the coolest cucumber around and managed to refrain from accusing her of losing his clothes. Convinced that the clothes had gone missing since leaving our possession, we searched the (tiny) apartment one more time in looking for the missing items. We had pretty much given up and resigned ourselves to going to the weekly market and the mall to buy Scott a new wardrobe, when lo and behold, we discovered a bottom drawer full of all of Scott's missing clothes!!! "Silly farang!" 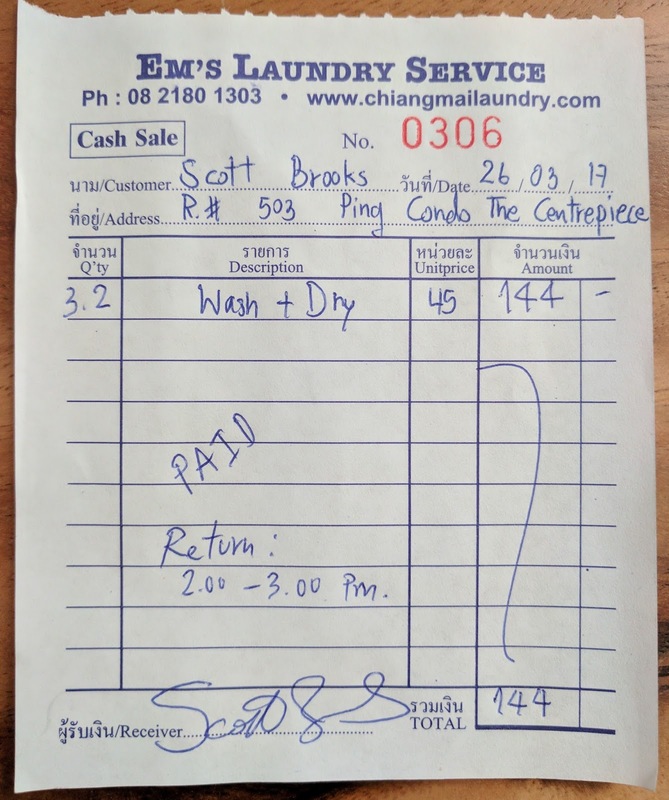 (farang = gringo in Thailand), Em must have thought, when Scott showed up at her laundry an hour later with the missing items!